This dish is a favourite of mine. It has two of my favourite ingredients chicken livers and pomegranate molasses. It is a great dish for people who are not so sure about liver, the sweets and sour pomegranate molasses takes away the edge of liver flavour (still, if you never ever tried liver before you might want to start with something less "anatomical" like pate). I came across this dish in couple of Syrian/Lebanese restaurants in London. I adjusted the recipe a bit by adding a splash of red wine and some butter towards the end to make the sauce thick and glossy. Start by frying the livers in the clarified butter. Once they brown form the out side add the molasses and red wine. Season with salt and pepper. Cook till the livers are cooked the way you like them. I like mine just done as over cooking make them tough. Once the livers are done remove from the pan and reduce the sauce to a quarter. Check the seasoning then add a knob of cold butter to the pan and stir in the sauce. Pour on top of the liver and eat with Arabic bread or griddled sliced bread. i had vitamense and regulary having food which is supposed to be nutrious to the body, but all in vain, on the contrary, i'm putting on extra weights. i was told that grapes juice is good? do u have any idea? I wish I can help! It is not an area I know much about. I can advice you on indications for ossiculoplasty in ossicular chain discontinuity if you wish but not about hair. Thank you for the comments. Have a go at making this dish. It has a surprisingly nice and unique flavour. "It is important to dry the liver completely before frying. The ghee butter need to be very hot to seal the livers before their juices come out. This will ruin the dish if it happens ...."
I will have to disagree on the last point. I like the juices to run out of the livers. It will just flavour and thicken the sauce, and with the wine, molasses and butter it will make the nicest of sauce to dip your bread in. u should surprise the visitors with recipes of al3eed's deserts. come on كبرتيني :( I am married but no kids yet. Eid Mubarak top you. I was planning to do some sweets for the blog but I am still without a camera. I should go try Yalla Yalla. It is getting some great reviews. Delicious! Using pomegranate molasses with liver never crossed my mind, will try. Welcome to my blog, Glad you left a message so I found out about your excellent blog. I really like it. I am making this, I have wonderful Lebanese pomegranate syrup and chicken livers are easy to get here. I have made chicken livers - rolled in breadcrumbs so they fry with a crisp exterior - with a Sicilian sweet and sour sauce of vinegar and sugar and loved them, this sounds like it goes one better, yum! Welcome to my blog. I hope you try the recipe. 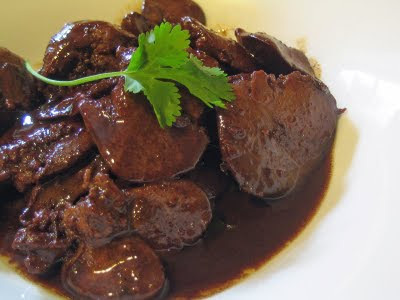 It is my favourite way of cooking chicken livers. The one you described sounds good. I think it will be somehow similar in taste. Finally! I've been searching for this recipe for hours! How long do you recommend that I fry the chicken liver? It depends how you like them. I would fry mine for 4 minutes or so. It depends how small you cut them as well. The best way to know is simply, give it a taste. Sounds divine! Can you please suggest an alternative to red wine as I'm one of those traditional sorts? If you don't want to use red wine you have few options; you can omit it all toghether and may be use a bit extra pomegranate molases to make more sour and use more better to get more sauce. Alternativly you can use red wine vineger. You can't use a huge amount as with wine but use a couple of table spoons. I knew I wanted to make this dish so I went ahead and purchased the livers and the pomegranate molasses. Not having any read wine, I simply omitted it and used a bit more butter and molasses. Divine! I am really glad you liked this recipe. I hope you get the chance to try more recipes from my blog. It actually bothers me a lot. I always allow people to use my pictures and recipes as long as they acknowledge them. I will contact that website. But I am not sure if they will listen. Thanks for your all the delicious recipes posted here. They are very good and usefull specially for me that I lived in London and now live in Portugal. Saying that I have a lot of difficulty finding many ingredients such as pomegranate molasses. Does someone know what I can use to substitute it? Welcome to my blog. I just read your review of Narinj restaurant in Kuwait. It seems the restaurant is either styled similar to the one in Damascus or it is by the same people. However, the Damascus one is the best restaurant in town with great food. Try my version and let me know what you think. You don't need the red wine if you don't want to use it. Just add a bit more molasses. So sorry for the late reply. I completely missed your comment. I never tried an alternative but I guess a sweet balsamic vineger might be ok. Here in the UK, you can buy Balsamic glazing (thickened balsamic vineger) from supermarket. You can use that in small quanitities. Add some natural molasses sugar (or any other brown sugar) for extra sweetness. You get me interested, I want to try these now myself! I just did this recipe but got it from a cooking book,but it turned bitter dont know why!! Sorry for the late reply. The livers might be contaminated with bile when they were being prepared. Is there a substitute for the red wine? Welcome to my blog. You don't need red wine at all. I really like the taste in cooking but it is not traditional ingredients. Just use the molasses. If your molasses is to sweet add a little red wine vineger right at the end. But don't over do it.